The butterflies of the species that will be seen this summer started life in the summer of last year when the females laid their eggs one by one (about 40 of them) on the above-ground roots of the bird-in-a-bush or solid-tubered Corydalis (Corydalis solida). At present the eggs are wintering. 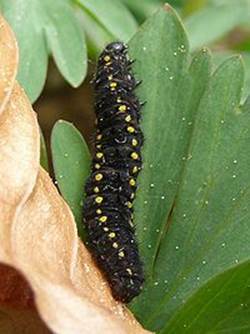 As soon as the Corydalis starts growing in early spring the caterpillars will hatch from the eggs; on the back of the clouded Apollo caterpillar we note two rows of yellow dots. After this they pupate, to start their visible life as imagos or mature butterflies in a month, the end of May. 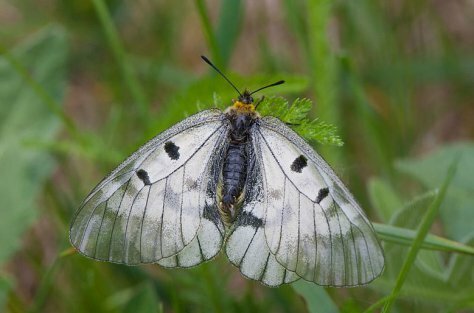 Only 25 years ago the clouded Apollo was only found in south-eastern and north-eastern Estonia but the distribution range of the species is extending towards west and today it may be one of the most abundant butterflies in some of its habitats. But let us leave some things to write about in summer too!.